The whole point of the Society of Stepmothers series is to capture the authentic experiences of stepmoms everywhere. 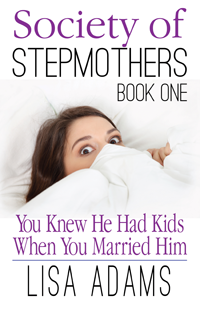 I started writing the first book, You Knew He Had Kids When You Married Him, early in my own life as a stepmother, inspired by the powerful friendships I made in the stepmom community and the stories of these women who quickly came to mean the world to me. You Knew He Had Kids When You Married Him introduces readers to Rhiannon "Annie" Tyler, a 28-year-old childless stepmom on the brink of marriage. Like most of us, bushy-tailed Rhiannon has absolutely no clue what life as a stepmother is really like. When a serendipitous meeting leads to membership in the Society of Stepmothers, however, Rhiannon can at least rely on the wisdom of her new friends to navigate the whole barrage of stepmom issues invading her overwrought brain. Ex-wives, loyalty-bound stepchildren, role confusion, social perceptions, finances, friendships, the constant emotional upheaval -- it's all here in book one of the Society of Stepmothers series. This first book is very intentionally written as a stepmom primer, a fictional equivalent to the many popular self-help classics on which countless stepmothers have come to rely. My hope is that the emotional immediacy of fiction will speak to readers (and perhaps their partners) in a way that validates their experiences and makes them feel even a little less alone.